Become an RPN member to have access to cutting-edge green procurement resources. You can also make a donation to support our work. To learn about membership benefits and consulting services, please click here. Subscribe to our email lists to stay in touch with RPN news and new responsible purchasing resources. Purchasing environmentally preferable paper products seems simple: choose products with a high percentage of post-consumer recycled content that are manufactured without chlorinated bleaching agents. Done. However, over the past few years, environmental standards for paper have become more complex. Some give credit for paper products that contain agricultural waste, "rapidly renewable" and (certified) sustainably harvested virgin tree fibers, and even "biobased" content. Come learn why purchasing environmentally preferable paper paper products is needed -- now more than ever -- and is the cornerstone of a sustainable purchasing program. 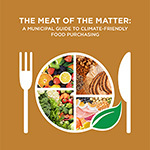 Friends of the Earth and RPN co-wrote The Meat of the Matter, a new report that presents a menu of tools, approaches, and examples to help cities and counties advance climate-friendly and healthy food procurement. Slides are also available for RPN and FOE's webinar that highlights this report, The Meat of the Matter: A Municipal Guide to Climate-Friendly Food Purchasing, which was held on Dec 13, 2017. RPN has put together a web page highlighting resources on food service ware. Food service ware has been a hot topic recently, due to concerns about toxic nonstick chemicals known as per- and poly-fluorinated alkyl substances (PFAS). 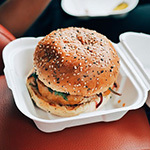 PFAS have been found in many moulded fiber compostable food service ware products. Starting July 1, 2018, Seattle food service businesses, including restaurants, grocery stores, delis, coffee shops, food trucks, and institutional cafeterias, will be prohibited from using plastic utensils, plastic straws, and plastic cocktail picks. Instead, businesses must use durable or compostable options. 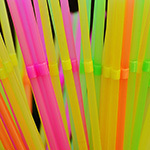 For straws, approved products include those made of compostable paper or compostable plastic. Institutional purchasers are increasingly interested in procuring products that are produced in a socially responsible manner. Knowing what to ask suppliers regarding how they are addressing negative labor and human rights impacts and what constitutes credible supporting documentation from a supplier is a challenge. 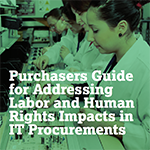 The Green Electronics Council's new guide, Purchasers Guide for Addressing Labor and Human Rights Impacts in IT Procurements, provides guidance for purchasing IT products from companies that are improving the social responsibility of their supply chains. he U.S. Food and Drug Administration (FDA) now restricts the use of 24 active ingredients in antiseptic products used in health care facilities due to insufficient safety and efficacy data. These products include health care personnel hand washes and rubs, surgical hand scrubs and rubs, and patient antiseptic skin preparations.